The pushmi-pullyu (pronounced “push-me—pull-you”) is an animal featured in the “Doctor Doolittle” books by Hugh Lofting. 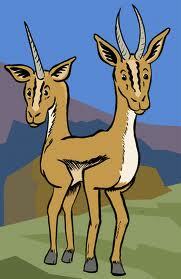 It is described as a “gazelle-unicorn cross” which has two heads (one of each) at opposite ends of its body. When it tries to move, both heads try to go in opposite directions. The two heads have different views of the world, of course, and so naturally they will want to move in different directions. As well as that, the two heads are different species, and so their needs – for example for food – will be different. The parallels with relationships are obvious. We have different beliefs, values and opinions from our partner (in some cases very different), and we have different needs from them. How do we balance that with the fact that we are joined in a long-term relationship? We have certain advantages over the pushmi-pullyu, of course. In the first place we are not physically inseparable from our partner and so it is quite possible for us to pursue separate interests. In this, of course, there is a danger, that one partner wants more independence than the other, and has different boundaries. Trust can be an issue, feelings of insecurity and jealousy for one partner, or of claustrophobia for the other can be very hard to control and deal with. Sometimes getting the right balance is difficult. Our other great advantage over the pushmi-pullyu is that we can communicate (although as I write that, I have a feeling that the Dr.Doolittle’s animals can talk too). With language comes the ability to explain to our partner what we want, and (perhaps more importantly) the ability to hear their views. And then, if we are not too stubborn, comes the ability to negotiate and find a compromise solution. Without the ability to compromise, the pushmi-pullyu’s movements might be governed by strength. Is the unicorn is stronger than the gazelle, it might be able to drag its weaker partner in the direction it wants to go. Sadly, some relationships are like this, dominated by one partner by means for physical or emotional abuse. Faced with a predator, the pushmi-pullyu might turn to flee. Its second head, on seeing the same predator might continue (carried by momentum) with that turn. And so I can imagine a threatened pushmi-pullyu rotating at great speed in its combined attempts to escape, thus getting precisely nowhere. Lucky predator! Some relationships are like this too, disabled by constant arguments. To survive, a pushmi-pullyu might turn one head to the left, the other to the right, and proceed in a sort of sideways sashay. Then it might have certain advantages over other species. One head can look where it’s going, while the other can look out for predators or particularly juicy-looking patches of grass. Relationships, when they work well, are like this too – “two heads are better than one”; “the whole is greater than the sum of its parts”. I am left wondering about the pushmi-pullyu, though. For one thing, I am concerned about how it gets rid of its bodily wastes. And for another, I wonder how the species ever procreated. I confess I’ve never read Mr.Lofting’s books; no doubt these questions are answered in detail in their pages….. This entry was posted in Relationships, Uncategorized and tagged arguments, choice, communication, compromise, control, listening, needs, negotiation, partnership, power, relationship. Bookmark the permalink.